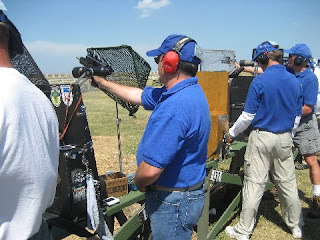 Our guest blogger, Chuck, is someone Double Tap and I have shot with for the last several years. When I ran into him this past weekend, he was just back from Camp Perry - the site of the National NRA Conventional Pistol match. He doesn't do much of the "go-fast stuff" (Defensive Pistol) anymore, instead choosing to focus on the Bullseye matches. Since I know next to nothing about the type of shooting he does, I asked him to write a bit about his experience. The National Matches are held at Camp Perry, Ohio starting with the Pistol Matches in the second week of July every year, baring a national emergency (like WWIII.) We shoot according to the rules for "NRA Conventional Pistol" at the matches (AKA "Bulls-eye") in one of the greatest tests of marksmanship in the USA, and with a history that dates back more than 100 years. 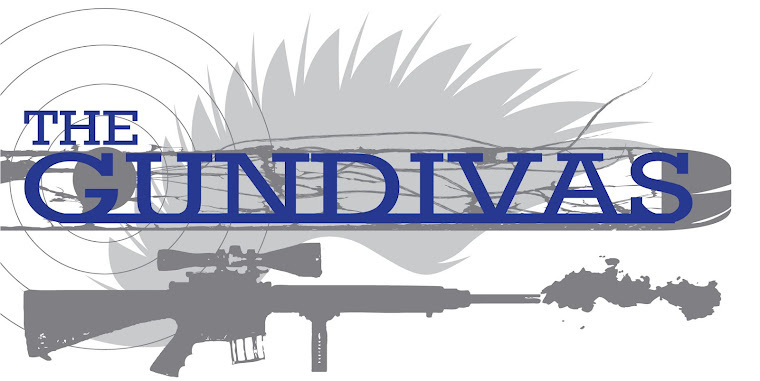 Slow fire happens at 50 yards, Timed and Rapid fire at 25 yards, and all competitors shoot at their own individual targets, and at the same time - 10 shots per target, then go forward and score. 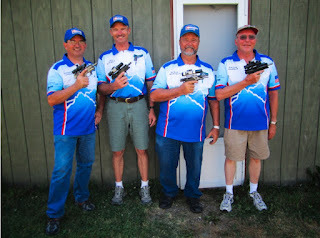 I attended the Pistol phase this year along with nearly 700 other pistol shooters. I am standing near the firing line on Range 1, lined up shoulder to shoulder with about 70 other shooters. There's a little light conversation while we're waiting for "Colors" prior to the first relay. One of the Range Officer's walkie talkies breaks squelch - "Five Seconds to Colors." I turn to face the flag pole. It's about 3/4 of a mile away, so I can't see it from here, but I know where it is. There's smoke from the cannon, and the National Anthem over the PA System. A few seconds later I hear the *boom* from the cannon. Still can't see the flag, but nevertheless, I've got my hat in my hand, my hand over my heart, and I'm standing at attention. Something about that makes me misty-eyed. There are two other ranges with 140 more shooters, the first of three relays today. I imagine they all feel the same. This is Camp Perry. Time for business. The tower talker reads from his script: "Shooters, on the line: you may open your gun boxes. Your three minute prep period starts now." The targets are fifty yards away, so I focus my spotting scope and line it up with my firing position. I say to myself: "One Fifty-three, Fifty-three, I am on point Fifty-three. Fifty-three is black." It is easy to lose track and shoot at the wrong target here. The targets are spaced with about a foot of air between them. The targets and firing points are assigned and numbered and with alternating black and white backgrounds, but you still have to pay attention, so as to not screw it up. Get your grip. Place your feet. Check your Natural Point of Aim. Say "fifty-three - black" again. Don't lose points by giving them away for free. This is Camp Perry. No more chit-chat. Clear your head. Look at the target number on the 25 yard bench, then at the one under my target, raise the pistol through both - dry fire. The wind is blowing from my right today and blowing me across the whole black of the bullseye, plus some. There's almost always some wind here. "That's okay. I know how to shoot in the wind," I tell myself - "sight alignment - trigger squeeze." Check the sights to verify I'm on my 50 yard setting - good to go. Dry fire some more to get used to holding the wind and waiting for the lulls. The tower talker resumes his script: "The preparation period has ended. This is the slow fire phase of the match - 10 rounds in 10 minutes. Load." -pause- "Is the line ready?" "The line is ready." "Ready on the right." "Ready on the left." "Ready on the firing line." The targets make a distinctive sound as they turn to face. Raise the gun. Front sight. FOCUS. There is nothing else. This is Camp Perry. Very good article. Sounds like a fun time.